Do note that most of these FAQs are about European Mistletoe (Viscum album). There are many other mistletoe species around the world, and these answers do not apply to all species. Can it grow in the ground? What host trees does it grow on? Does it grow on Oak? My mistletoe bough has broken off/my mistletoe tree has been felled – can I regrow it from the old plant? Will mistletoe damage the host tree? How should I manage mistletoe? Why do I never get any berries on some/all of my mistletoe? Where can I buy mistletoe? Where can I sell mistletoe? 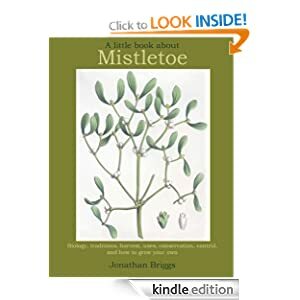 If your question isn’t answered here why not buy a copy of Jonathan Briggs’ little book introducing all aspects of mistletoe is available on Amazon. Mistletoe is a parasitic plant that grows on branches of trees. There are up to 1500 species of mistletoe around the world. The ‘classic’ mistletoe of Europe is Viscum album. There’s more about this on the biology pages. No! Mistletoe can only grow on host trees. You cannot grow it in soil or compost – you need a suitable host species for it to grow on. If you have a suitable host tree you can sow seeds on a branch. Detailed instructions are given within this site on the Grow Your Own pages. Do note that it can usually only be grown from seed – when people talk about ‘grafting’ mistletoe this is what they mean – the seed germinates and the young seedling grafts itself onto the host. It is not grafting in the horticultural sense. Seeds (one in each berry) should be sown in February/March for best results. Fresh berries are available to buy online – details and links are on the Grow Your Own pages. European Mistletoe, Viscum album, grows on a wide range of host trees. Its favourite host is cultivated apple – about 50% of British Mistletoe grows on this tree. Other common hosts include poplars and willows – and a wide variety of shrubs and trees in the Rosaceae. Some subspecies of Viscum album can grow on firs and pines – these subspecies do not occur in Britain. Other species of mistletoe have differing host preferences. Many people associate mistletoe with oak because of the stories of the ancient druids worshipping mistletoe on oak. In reality European Mistletoe (Viscum album) is very rare on oak – which is not a suitable host. A few mistletoe-bearing oaks are known in Britain – but these are extremely rare. Other species of mistletoe, including several in North America and one less common species in central Europe, can be found commonly on oak – but these mistletoe species are not the one used in druidic legend. No. Once the branch has been broken off, or the tree has died, the mistletoe is doomed too. It can survive for a few years on trees that have fallen over, which often still have some life, but plants cannot be moved from host to host – you need to start again with seeds. Is mistletoe rare in Britain? Mistletoe in Britain mostly grows in the south-west midlands – Herefordshire, Worcestershire, Gloucestershire and Somerset. In this area it is common. Outside this area it is generally scarce or very rare, occurring as small isolated populations or individual plants. Most mistletoe in Britain grows on apple trees – and the loss of the traditional apple tree orchards is obviously having an effect on mistletoe. This will reduce the amount of mistletoe we have , particularly the amount available for harvesting each season, but it is not (probably) endangering the plant, as it grows on many other hosts, particularly in its main area. For more information visit the Distribution pages. Each growth of mistletoe will affect the branch it is on – reducing the tree’s own growth and development on that branch. So a few mistletoe growths on a largeish tree will not have a major effect. But too many mistletoe growths, particularly on small trees, will reduce host growth on all branches. This will significantly affect the tree, reducing fruit crop (e.g. in apple trees), causing water stress in summer and increasing risk of wind-blow in winter. To keep both mistletoe and host healthy you need to actively manage your mistletoe (see the Management pages and the next FAQ below…). Some other mistletoe species around the world are major economic pests – affecting forestry crops and fruit yields. European mistletoe needs little management where it is on a large tree (e.g. tall limes) but must be actively managed on smaller trees (e.g. apple trees). Management is best done in the winter, when the host has lost its leaves and you can see all the mistletoe growths. Basic rules are to cut back both male and female growths each season (too many people just cut the female which has berries, for Christmas, and leave the berryless male to grow unchecked). Where there is significant overgrowth substantial management and pruning may be needed – perhaps including removal of some heavily-infected branches. Once you have a reasonable balance of host:parasite management can be limited to pruning back, say, a third of each growth every year and removal/rubbing off of any hew seedlings that are spotted if necessary. See the Management pages and the Information sheets. Mistletoe has separate male and female plants – and if yours is a male it won’t have berries. Even some female plants don’t have berries if they grow in isolated situations, away from other mistletoe populations and therefore any male plants. Where there are several mistletoe growths the male and female plants are readily distinguished – the male tends to be more pendulous, the female is more upright. Some growths can seem to be a mix of the two – as seeds will germinate very close to each other, and one mistletoe can grow on another, creating a mixed bunch. Mistletoe is (usually) readily available within the main growing areas of the UK – Herefordshire, Worcestershire, and low-lying parts of Gloucestershire and Somerset. Outside these areas Christmas mistletoe is less easy to buy – and is often imported from France or transported from the native UK areas. For UK wholesale sales there are the traditional mistletoe auctions markets at Tenbury Wells, in North Worcestershire. Details of these are available through the Tenbury Mistletoe Festival site. For domestic customer there are now several online mistletoe traders each Christmas, including our allied site The English Mistletoe Shop, which sells mistletoe, grow-kits and books etc. If you have mistletoe for sale you will find best prices are outside the main growing area. Do be aware that wholesale prices can be very low – it can be little more than ‘pocket money’ – but it is some payment towards the effort of mistletoe management. To sell wholesale you could take your crop to the auctions at Tenbury Wells – details and contacts on the Tenbury Mistletoe Festival page. Or you can take stock direct to wholesale markets in the London area. To sell retail you can try via local greengrocers, florists for indirect sales – or find your own market, bearing in mind most demand is outside the ‘3 counties’ area. Yes and No! Some mistletoe species (particularly some in North America) are considered very toxic. European mistletoe certainly contains many toxins, mostly complex proteins called Lectins. In concentrated form these can be dangerous. But European mistletoe has a long history in herbal medicine and even as a winter fodder crop – so it’s not as bad as many think. It is definitely NOT edible for humans – but it is eaten readily by livestock when they can reach it. Small quantities eaten by livestock should not be a problem, but large quantities should be avoided. Dried mistletoe is widely available as a therapeutic herbal tea in continental Europe, but hasn’t caught on in Britain. Some of the Lectins may be reduced in the drying process.